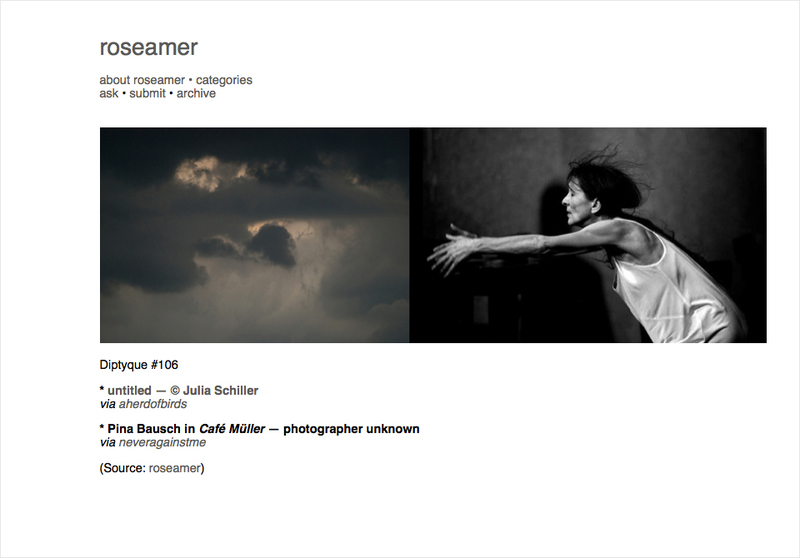 I am glad that one of my photographs became an inspiration for one of roseamer‘s diptychs. Rose – whose name is not Rose but Alexia Chandon-Piazza – likes diptychs (obviously), letters of fallen trees and collecting quotes from her reading of the moment. She is also a prolific writer and artist. Check out her work sometime! This entry was posted in Feature, Photography and tagged Alexia Chandon-Piazza, diptych, Diptyque, Diptyque #106, Pina Bausch, roseamer. Bookmark the permalink.